America is the home of the conspiracy theory. A third of its citizens believe that the Bush administration was somehow complicit in the attack on the twin towers on 11 September 2001. Either the White House knew about it and sat on its hands or they helped to bring it about. Paul Feldman reports. In many ways, however, the 9/11 theory is a modern version of Japan’s “surprise” attack on Pearl Harbour that brought America into World War Two in December 1941. President Roosevelt had promised to keep the United States out of “Europe’s war” and public opinion was on his side. Some anti-war opponents immediately cried “conspiracy”. Roosevelt allegedly knew about the attack because the military had broken Japanese codes. Yet he did nothing about it. Worse, he allowed it to happen because it would give him the excuse he needed to bring America into the war. The “surprise” attack was, in reality, no surprise goes the story. Just as after 9/11, official inquiries investigated what had happened and there was no “surprise” when they failed to support the conspiracy theory. It was more or less the same story in 1917. Then the “bankers” were charged with dragging America in World War One on the side of the Allies because their loans were dependent on Germany’s defeat. So each period of history has its conspiracy theories. There are those, for example, who attribute the meltdown of the financial system in 2008 to a group of bankers, mostly Jewish it seems, who stood to benefit from the demise of their rivals. Others claim that the Federal Reserve – America’s central bank – deliberately prompted the credit crunch. More often than not, the conspiracy theories attribute super-human powers of concealment to state bodies whose hidden agenda is totalitarian-type control of the American people in order to perpetuate their power. Some 9/11 theories imply that thousands were “in on it”. But whatever the strength or weakness of the theories, their source does not lie simply within the minds or imagination of those who develop them. In fact, the theories reflect real, actual conspiracies by the American state that have fuelled people’s paranoia about their government, argues Kathryn Olmsted with plenty of analysis and evidence in support. While she does not pass judgement on the conspiracy theories, she puts them in an historical and social context. They are explained through the essentially alienated relationship between the American people and the country’s state. Of course, the same argument could be made for every “democracy”. Olmsted rightly says that successive generations of anti-government conspiracy theorists have at least one thing in common, that “when they charge that the government has plotted, lied and covered up, they’re often right”. New laws criminalized dissent and anti-war opponents were hounded by a young J. Edgar Hoover at the Justice Department. The American state accrued more and more powers as the century developed, especially after the cold war began. Olmsted notes how the CIA teamed up with the mafia on murder plots (aimed at Castro and others), while the FBI illegally spied on civil rights leaders. President Nixon used state powers to conspire against and punish his political enemies. As for the mass weapons of deception deployed to justify the invasion of Iraq, history has already judged on that particular episode of the Anglo-American special relationship. This, says Olmsted, led many Americans to believe Bush “capable of the worst crimes imaginable”. 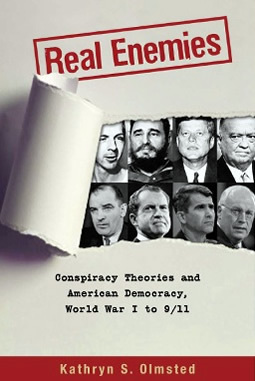 In some detail she covers the origins of US involvement in World War One, Pearl Harbour, McCarthyism in the 1950s, the Kennedy assassination, the Nixon/Watergate period, CIA conspiracies and secret experiments as well as 9/11. Largely it is the story of official cover-up, lying, unauthorised use of state power, the invention of “enemies of the state”, secret wars, assassination of foreign leaders, support for military coups abroad and spying on domestic opponents at home, as well as other crimes and misdemeanours. By the end of the period, trust in the federal state had plummeted to all-time lows. No surprise there. The most powerful – and self-damaging – conspiracy of the post-war period was launched by a maverick senator, Joseph McCarthy in 1951. The Soviet Union had spied on its war-time partner in the war with Nazi Germany. As a result, it was able to test its own atomic bomb in 1949, just four years after the US dropped weapons on Hiroshima and Nagasaki. But by the early 1950s, the spy rings had been smashed and when McCarthy denounced a conspiracy “so immense” at the highest levels of government, no Soviet spies of any importance remained, says Olmsted. When McCarthy got going, however, it was in the wake of the Chinese Revolution of 1949 and the outbreak of the Korean War in 1950. When McCarthy was finally repudiated by the Eisenhower administration in 1954, the baton passed to Hoover and the FBI which “unhindered by any oversight, executive or congressional”, used wiretaps, bugs, burglaries, informants and agents provocateurs against hundreds of thousands of American “subversives”. Conspiracy theorists on the left came to believe that “concealed enemies of the right” had captured key parts of government and worked in agencies so secret that no one knew about them. From there it was not a great leap, for example, to imagine that the state killed President Kennedy in 1963 because he was too soft on the country’s enemies. The state’s credibility was further eroded during the Nixon period, when illegal acts reached new depths. The White House sabotaged the work of its political opponents and enemies, fabricated newspaper stories, broke into the headquarters of the Democratic Party at the Watergate complex and used state agencies to further the interests of the Republican presidency. In 1974, Nixon resigned on the eve of a Senate vote to impeach him for “high crimes and misdemeanours”. The 37th president of the United States, Nixon was the first to resign in this fashion. Olmsted is clear: the state is ultimately responsible for the conspiracy theories that are “endemic to American democracy”. She identifies three broad ways that government actions have helped create conspiracy theories: by promoting conspiracy theories of their own (e.g. threat from “poison of disloyalty”); by using their powers to plot, and conceal, real conspiracies (arms for hostages, or Irangate); by actively suppressing alternative views. Over 9/11, for example, a secret government plot to bring down the towers would have involved hundreds if not thousands of people. Where are they? Are they all dead, done away with by the state in a massive cover-up? And for what purpose? To invade Afghanistan, where US troops have failed to defeat the Taliban in a decade of fighting? The truth is more prosaic. The state is not made up of superhuman supermen who do what they want and get everything right. Huge resources are deployed in the search for control. A secretive intelligence network is now reckoned to constitute a fourth arm of government – after the executive (president), judicial and legislative (Congress). According to the Washington Post, this world of smoke and mirrors comprises over 1,200 government agencies and almost 2,000 private companies in more than 10,000 locations across the country. Its annual budget is $80 billion. There are an astonishing 845,000 people with top secret clearance. Far from providing a guiding hand on events, this massive bureaucracy is often at war with itself, leaks secrets like a sieve and has many more failures to its name than successes. You would hardly rate the invasion of Iraq a major victory in “nation building”, while the failure to discover any weapons of mass destruction only reinforced the public’s general distrust in government. Even Iraq’s oil seems destined for China, whose economy is far stronger than America’s. The outlook of the conspiracy theorist poses other problems. If the state is able to mount conspiracy after conspiracy, to stay one step ahead of truth seekers, or to shape public opinion in their image, they can never be stopped. It becomes a conspiracy too far, with another one always around the corner. The state can never be defeated because it’s essentially too clever, too manipulative, too powerful. Olmsted defends conspiracy theorists for getting the basic issue right, even if they get the details wrong. “It is the secret actions of the government that are the real enemies of democracy.” This is all too true if we accept that representative democracy, a concept first developed by American revolutionaries in the war of independence against Britain, is the last word on the subject. Alternatively, we can view it is a form of democracy assumed by a state that, ultimately, exists not to “serve the people” but to protect a narrower set of interests. These interests – industrial, financial, military and intelligence – are far more powerful than elected officials, whatever their own intentions. That helps to explain, for example, why the hopes in Barack Obama were misplaced. He was soon integrated into the real “conspiracy”, that of protecting the status quo itself. The renewing of the American revolution, in order to create finally a democracy of the people, by the people, for the people, is long overdue.